One of the plesiosaurs of Jurassic period of Mesozoic era is a simolestes – 6 m marine predator with 1 m skull and pack of teeth on ends of jaws. Earlier it was thought, that animal hunted on large prey and teared off large chunks of meat by rotating, like today’s crocodiles do; but modern studies show, that simolestes’ jaws were not so strong and they ate mostly mollusks, fishes and other small reptiles. They had 2 pairs of paws-fins, with which they made simultaneous or alternating swings, like other plesiosaurs did; modern simolestes’ bones studies show, that they belonged to true plesiosaurs and not to the earlier primitive forms. Simolestes had short neck, broad jaws and short tail, which make them typical pliosaurs, belonging to plesiosaurs. During life their teeth were positioned much more vertically, then fossilized skull of almost complete skeleton of reptile has; their rotation to outer sides is caused by crushing and deformations of skull during millions of years in Earth‘s crust. Fossils of animals were found in England and France, and also India. For the first time they were described in 1877 year by Richard Lydekker. 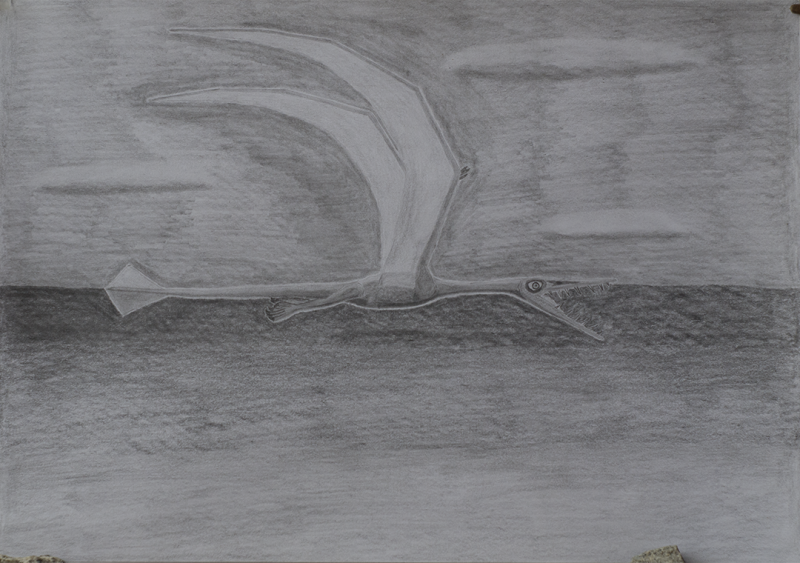 Among long-necked plesiosaurus there were animals with diamond-shaped tail fin, similar to one, which flying pterosaurs rhamphorhynchus had, for example, seeleyosaurus. They lived on Earth in the beginning of Jurassic period of Mesozoic era; animals had large paws-fins, with which were able to perform alternating or simultaneous swings, achieving high acceleration and maneuverability. Seeleyosaurus ate fish, birds and other small marine reptiles, wherein they themselves were vulnerable to their short-necked relatives pliosaurus with larger jaws, teeth and mass; they had to show agility, intelligence and maneuverability to not become their breakfast. Currently there is no precise data, but maybe many plesiosaurus had the same diamond-shaped tail fin, there’ll be ability to say this for sure, when more fossils with tail skin impressions will be found. At these days seeleyosaurus are known only from 1 almost complete skeleton, which was found in Germany, it contains impressions of this steering adaptation of the animals. 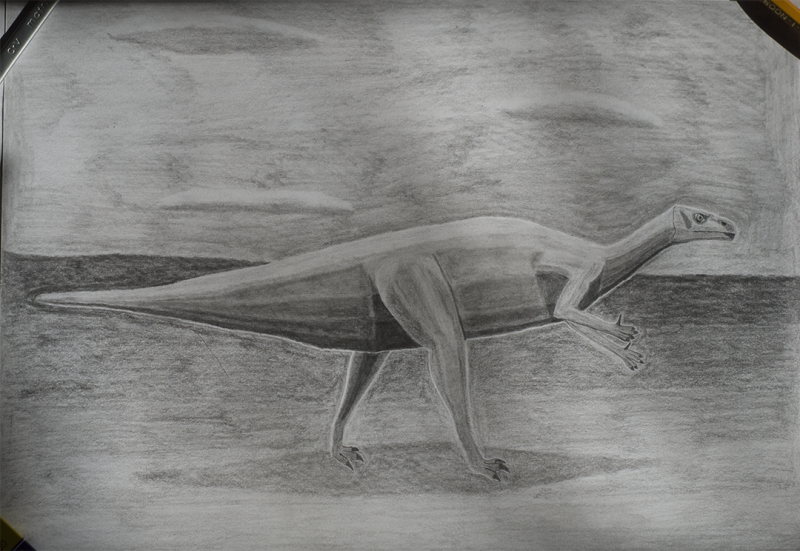 In Triassic period of Mesozoic era lakes, seas and oceans were already inhabited by large reptiles, for example, ceresiosaurus were among them – ancestors of plesiosaurus, which appeared in a later Jurassic period. They reached in length 3 m and already had much of the features of a plesiosaurus : long neck, small head and limbs, almost transformed into the fins. They were fast swimmers and propelled in the water like modern penguins do, chasing small and fast prey. 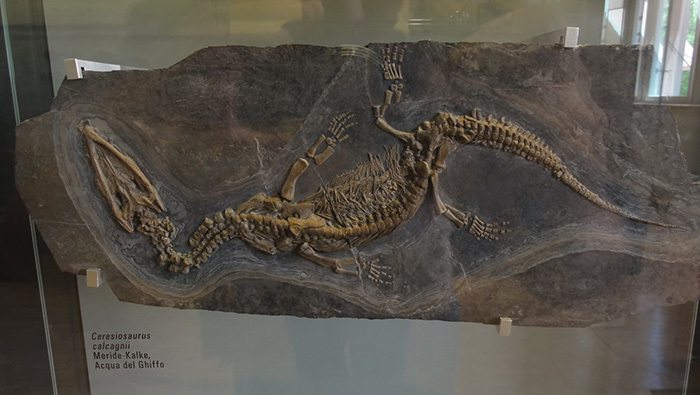 Species name means “Lizard from Ceresio” – this is a name of lake on the south of Switzerland, near which fossils of these reptiles were found for the first time. Ceresiosaurus lived on Earth in the middle Triassic period 230 – 220 millions of years ago and inhabited small coastal lagoons, living alongside with other marine and land reptiles. 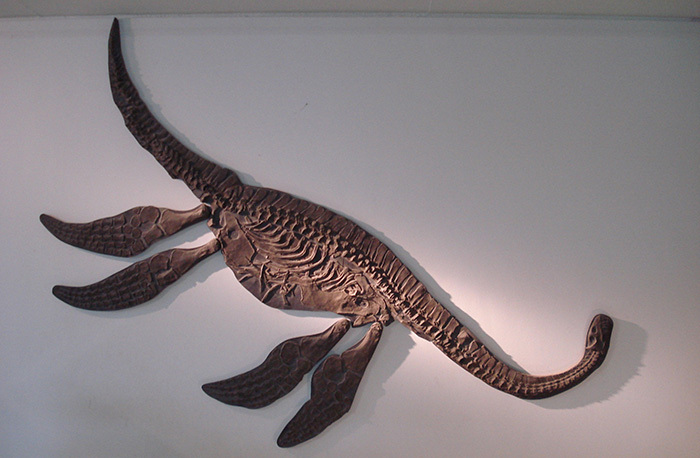 Form of their limbs tells, that they were able to move on the ground, but not as effective, as other nothosaurus ( animals species, to which ceresiosaurus belong ) did, and already moved to completely marine lifestyle. For the first time fossils of this animals species were found and described in 1931 year by Bernhard Peyer, later people found other fossils of ceresiosaurus in this area. In Jurassic seas of Mesozoic era different animals lived : among them there were liopleurodons – reptiles belonging to plesiosaurs, which had teeth like of modern orcas. Their scientific name is translated from Ancient Greek as “having smooth sided teeth“, they grew up to 7 m in length, had mass around 1 – 1.7 tons and were one of the largest marine predators of their times. Modern studies show, that their mouth closing strength was not so big, as modern crocodiles have or replaced then in Cretaceous period mosasaurs had, but they compensated this with gigantic size and sharp teeth; they moved in water by flapping alternately ( for maneuverability ) or together ( for acceleration ) with both pairs of their flippers-like limbs and flew, like birds, in depths of Mesozoic waters. Such kind of propulsion is not the most energy-efficient, but provides high acceleration and maneuverability, which is needed for ambush predator. Liopleurodons lived approximately 160 – 150 millions of years ago; their skull length reached 1/5th of their overall length and was 1.2 m maximum in absolute value; they had short neck, which is characteristic for pliosaurus family ( which belongs to plesiosaurus ), this differentiated them from long-necked members of this species and allowed them to hunt on larger preys. Up to current time not much fossils of liopleurodons were found : 1 almost complete skeleton and small amount of fragments, including teeth. Mainly they were found in Europe : in England and France, there are also findings in Russia. 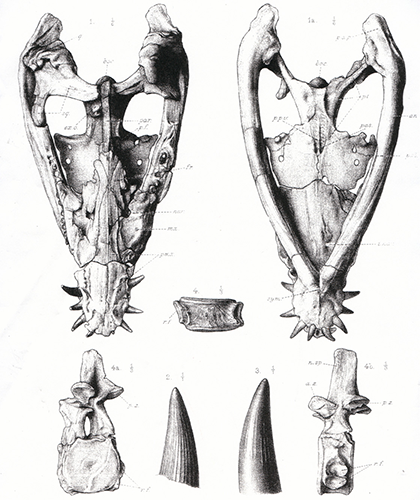 For the first time animals of this species were studied and described in 1873 year by Henri Émile Sauvage; later this marine reptiles species was examined again by other paleontologists, performed its reclassification. Pterosaurs began their existence on the Earth in Triassic period, now it is not known for sure from which animals they evolved, presumably, from small carnivore dinosaurs; one of the earliest know flying reptiles is a eudimorphodon. Name of species means “True dimorpho teethed” or “Having two types of teeth“; at front sides of jaws they had fangs, at middle and back sides small teeth with 5 cusps, such teeth are specialized for hunting on fishes and insects. They differ animal very much from all later pterosaurs, so eudimorphodon is not their ancestor, but a spin off branch from main one. Their wingspan was 1 m, length was the same, mass was around 10 kg; they lived in late Triassic period around 210 – 200 millions of years ago. 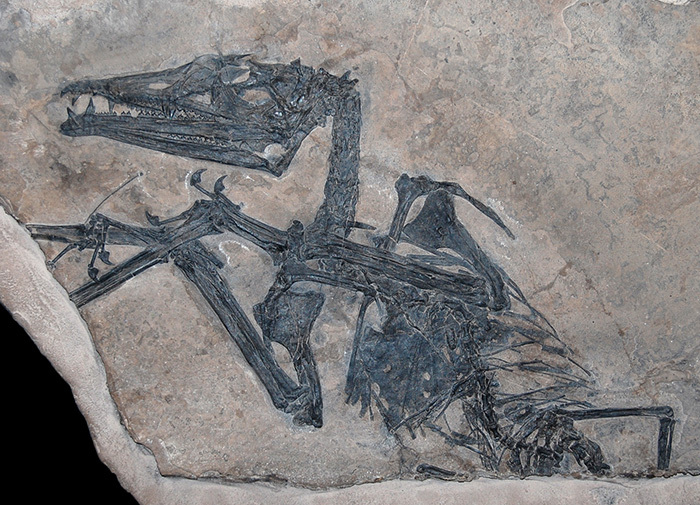 For the first time eudimorphodon skeleton were found in Italy in 1973 by explorer Mario Pandolfi near Bergamo city. Maybe on ends of tails of animals diamond-shaped flap were located, like later rhamphorhynchus had, but for now there is no exact data. Teeth of eudimorphodons came into tight contact, when jaws closed, on some of them there are wearing and friction traces, which means, that they were able to chew food and not only ate it whole or in a large chunks. 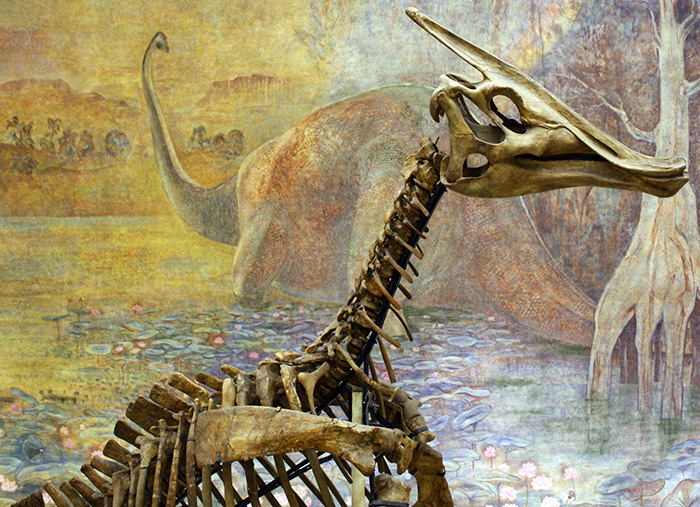 Currently a couple of animals skeletons were found at different locations of the world, including Greenland and Texas ( USA ), which makes them one of the most studied pterosaurs, initially found in Italy. Among dinosaurs there were flying species, for example, rhamphorhynchus – toothy reptiles with long tail, vane from skin and hollow bones. They reached 1.26 m in length and 1.81 m in wingspan, wherein their mass was small, thanks to hollow bones. Rhamphorhynchus lived on Earth in Jurassic Period 170 – 140 millions of years ago; hunted on fishes and insects ( their forward-looking teeth were adapted for hunting on them ) and during flying held their heads parallel to the ground. Currently there are no exact data on whether they were warm or cold blooded; soon after hatching from eggs they were able to fly and reached adult sizes by age of 2 – 3 years. They were able to live in nocturnal lifestyle, but there are also no exact information about this; they were hunted by other animals, for example, were found skeletons of flying reptile and large fish, which tangled in skin membranes of reptile, they drowned together and went to the bottom, where they were covered by the silt and preserved in such state for hundreds of millions of years up to ours days. 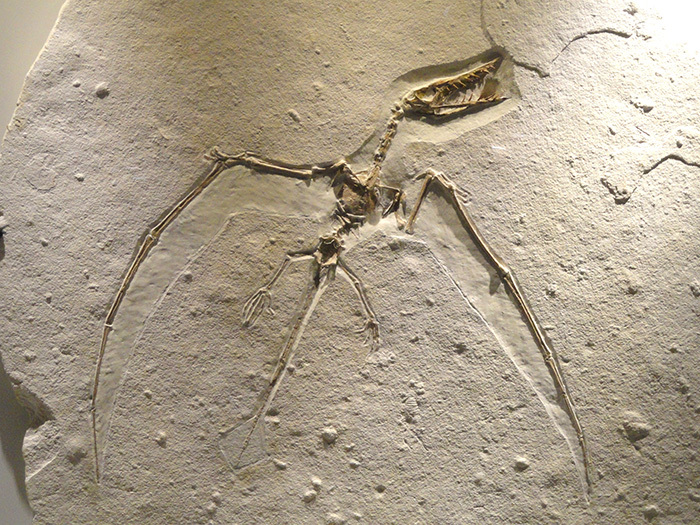 Fossils of Rhamphorhynchus were found in Europe and Northern Africa, the most well-preserved and complete ones were found in Bavaria Germany. Their skeletons were described for the first time in 1825 year by collector Georg Graf zu Münster and scientists Samuel Thomas von Soemmerring and Georg August Goldfuss. One of the first discovered and scientifically described dinosaurs is an iguanodon, which was first described by fossilized teeth, that look like iguana‘s, but much larger, in 1820ies in England by Gideon Mantell. First it were reconstructed as massive animal, that looks like iguana with elephant size and spike on a nose, later findings showed, that spike located not on the nose, but on the hands of reptile, on a thumbs, and was used for protection from predators and food gathering. Also, findings showed, that iguanodons are not so massive and they were placed in upright vertical position, with basement on back paws and tile. Researches of 20th century made it clear, that this reconstruction is also not right, because at such position tile would be broken; and now animal is shown with horizontal body position and straight tile, which mainly moves on 4 legs and sometimes goes to running on 2 back paws. Iguanodons reached 12 m in length and 3 tons mass; wherein their maximal running speed was 24 km/h on back limbs; they lived at the beginning of a Cretaceous period 140 – 120 millions of years ago. Animal ate plants, in mouths they had 2 rows of teeth, which replaced each other, with which they chewed food; teeth located deeply in mouths, this tells, that they had some kinds of cheeks : muscular or completely from skin. 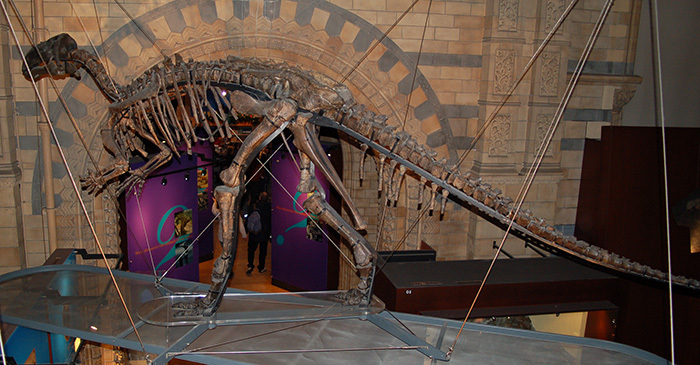 For now there are no undoubted data on whether these animals lived in large herds or in small families; adult animals preferred to move on all 4 legs, when they obtained size and weight ( by this time length of their arms reached 70% of the back legs length ), while light-weighted juveniles ran mostly on back paws ( their hands was only 60% of legs length ). By this time lots of iguanodons fossils were found in Europe, North America and presumably in Africa and Asia; many of the subspecies, initially placed in relation to iguanodons, now are moved into separate species, part of the others changed their location inside iguanodons genera. To date iguanodons are one of the most studied dinosaurs species and, together with megalosaurus and hylaeosaurus initially formed this genera of ancient reptiles.